Internal and external customers now expect to reach your Help Desk for customer service and support from any device, at any time, and from anywhere. In today’s Millennial-driven economy, the Help Desk’s response to requests must be immediate and delivered in the customer’s preferred medium. In the past, Help Desk Management and staff only had to monitor traditional channels such as phone and email. A forward looking Help Desk must now have a social media strategy plan. You must employ new generation Help Desk social media strategies to actively monitor and respond to many different Help Desk Multi-channel support mediums to be successful. platform for seamless handling. This means if a Help Desk chat support session with a customer is started, the chat text will be captured in the ticket work notes. If a customer uses Twitter to tweet a question or comment about your company, products, or services, the interaction stream can be captured inside a ticket. Freshdesk states “Facebook comments and Twitter mentions automatically get converted to helpdesk tickets that you can assign to your Agents just like any other regular ticket. Your Agents can even directly answer the customer on the same social media platform without leaving their helpdesk portal.” This is a great benefit to allow a single source of knowledge and complete visibility from one Help Desk Multi-channel support platform. 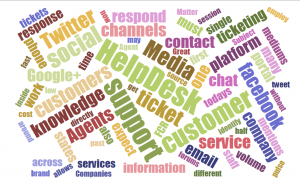 Help Desk Ticket – The Help Desk industry standard is that every interaction with a customer must be recorded into a ticket as the official record. This is simplified when the support channel is integrated into the ticketing application. Rules based ticket routing and assignment – You can identify your Agents by subject matter expertise or channel focus and they will receive the initial support requests based on the specific contact channels they have been trained for. Real-time chat integration – Whether the customer initially engaged the Help Desk via chat or the Help Desk Agent opened up a chat conversation during the support session, the entire interaction is captured inside the ticket. Social Media Integration – Facebook comments and Twitter mentions automatically get converted to helpdesk tickets through out of the box Application Program Interface (API), which allows the Social Media platform communicate bi-directionally with the ticket application. 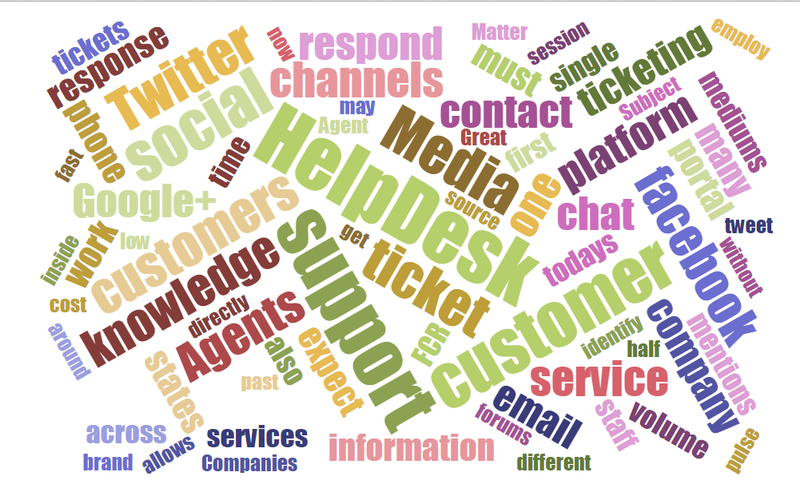 Using Twitter at your Help Desk for customer support has some huge advantages. It is cost effective, fast, keeps staff engaged, and helps promote your brand. Ben Parr at Mashable states “Great customer service gets talked about, and this can lead to more sales and more attention. Twitter is one of the most viral platforms around, which can make one happy customer into an international story.” Create specific keyword search streams to track Twitter mentions and direct messages enabling your Help Desk ticketing platform to create a support ticket. This Twitter integration lets you engage in selected conversation across your current and potential customer base. Multi-channel support offers customers many avenues to make requests. The support your Help Desk Agents provides must be consistent, accurate, and repeatable across all channels. Using segmented knowledge for each of your support channels in most cases is not a recommended knowledge centric strategy. Implement a single repository of knowledge across your Help Desk Multi-channels and organization. Require all Help Desk Agents to provide customer support using and maturing the solutions directly from the knowledge base. While your Help Desk Agents are referencing the same knowledge repository during customer support, the message to the customer will have a different format based on the Help Desk support channel used. For example email you may respond with a paragraph of information with a link to your public facing self-service portal for detailed information. With Twitter you are limited to 140 characters. Your tweet response will be a specific and to the point message and should also including a link to your public facing self-service portal. Empower your front line Help Desk Agents with an efficient process to flag poor knowledge base solutions while the customer support sessions are in-progress. Follow up comments during downtime are also helpful explaining what did not work and what solution, if any, did the Help Desk Agent employ to solve the issue. In addition, many ticketing applications can relate the specific knowledge article used to the support ticket. By running a report on First Contact Resolution (FCR) rates compared to your ticket categories and customer support channel you can identify trends. Analyze your higher volume ticket categories that are trending with low FCR rates and flag them. Engage your Subject Matter Experts (SME) to develop consistent, accurate, and repeatable knowledge solutions for the high volume issues flagged for low FCR. It is critical to deliver right answers to customers the very first time. Advances in Help Desk Multi-channel support platforms have enable customer support centers to immediately respond to not only requests for service but comments and feedback on social medium forums. Unifying support from one platform, allows Help Desk Agents to cover multiple channels decreasing the per contact cost. Companies have benefited with their brand, sales, and support.